As the name implies, an insulation resistance test measures the total resistance between any two points separated by electrical insulation. The test, therefore, determines how effective the dielectric (insulation) is in resisting the flow of electrical current. Such tests are useful for checking the quality of insulation, not only when a product is first manufactured but also over time as the product is used. Performing such tests at regular time intervals can detect impending insulation failures before they occur and prevent user accidents or costly product repairs. An insulation resistance test usually has four phases: charge, dwell, measure, and discharge. During the charge phase, the voltage is ramped from zero to the selected voltage, which provides stabilization time and limits the inrush current to the DUT. Once the voltage reaches the selected value, the voltage can then be allowed to dwell or hold at this voltage before measurements begin. Insulation resistance testers typically have 4 output connections - ground, shield, (+), and (-) - to cover a wide variety of applications. The output voltage is typically in the range of 50 to 1000 Volts DC. 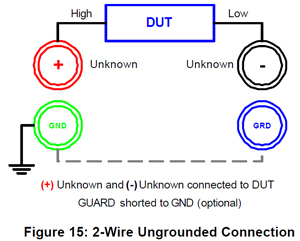 In performing the test, the operator first connects the DUT as shown in Figures 15 or 16. The instrument measures and displays the measured resistance. When the voltage is applied, some current immediately starts to flow through the insulation. This current flow has three components - a "dielectric absorption" current, a charging current, and a leakage current. Dielectric absorption is a physical phenomenon in which the insulation appears to "absorb" and retain an electrical charge slowly over time. This is demonstrated by applying a voltage to a capacitor for an extended period of time then quickly discharging it to zero voltage. 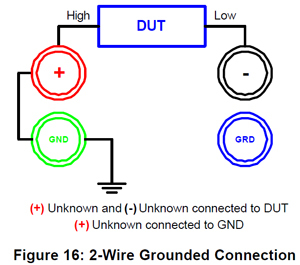 If the capacitor is left open circuited for a long period and is then connected to a voltmeter, the meter will read a small voltage. This residual voltage is caused by "dielectric absorption". This phenomenon is commonly associated with electrolytic capacitors.